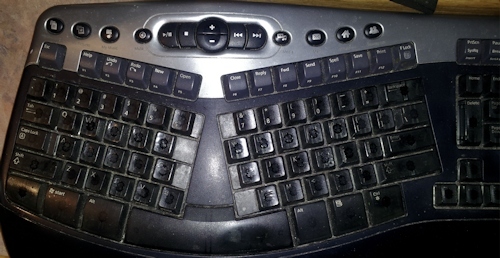 In the July 2008 issue of Smart Computing Magazine, their Action Editor responds to an inquiry about the letters on a keyboard wearing off. …[after offering a newer-model keyboard to the complaining customer] HP researched support calls for the reader’s original product and didn’t find other customers experiencing this issue, so the issue appears isolated. As I scanned through old issues of the magazine and found this, I have to admit that I squealed my frustration. Since the earliest computer keyboards, I’ve been calling for deeper laser cut letter embedding instead of “stick on” or “paint on” letters and numbers on keyboard. I even spent a few months working with the Microsoft hardware group on testing and reviewing their new line of keyboards to ensure the letters and numbers stayed and weren’t worn off within a few months or less. Unfortunately, my highly vocal complaints to the keyboard manufacturing community continue to go unheeded as I personally continue to wear out keyboards. Microsoft does have the only keyboard I’ve found that lasts the longest, Logitech the next longest in my information research. I trained to type on a manual keyboard but quickly switched to an electric as soon as they gained popularity. Yes, I have a strong key strike, and yes, I have long nails, but the keyboard should should put up with any form of abuse for more than two or three months. Few do. If your keyboard wears out sooner than you think is appropriate, please nag. Nag them to replace it. Nag them to make the letters and numbers last. Too few people just get a new keyboard or stick on new keyboard number and letter stickers or use a permanent marker. Unless you are heard, companies like HP are going to continue to think that worn out keyboard keys are isolated cases.